UFC on Versus 1: News and Notes/Who or What’s Next? On paper, no one expected a very exciting fight between these two light heavyweights. But the two, surprisingly put on a rather entertaining show. Brilz and Schafer traded punches wildly while on the feet with Brilz getting the better of most of the exchanges. Jason Brilz was able to control most of the fight inside the clinch, pushing Schafer up against the cage. Occasionally, Brilz was able to get a single-leg take down but wasn’t able to keep Schafer down for very long. Schafer sent the crowd in a frenzy in the first round, when he landed a flying knee that wobbled Brilz, but wasn’t able to capitalize. Other than that, Brilz wasn’t in any other real danger for the rest of the fight. Schafer tried to work a few guillotine chokes when Brilz would attempt take downs but to no avail. Brilz earned the unanimous decision victory to earn himself his 3rd win inside the octagon. Jason Brilz – I’d like to see Brilz get a small step up in competition. Possibly against Matt Hamill, Keith Jardine, or Brian Stann. Eric Schafer – Most likely this is the last time we’ll see Schafer on a UFC card for some time. Back to the local circuit for “Red”. It was a rough night for the Brazilian UFC new-comer, Julio Paulino. Pierce used his superior wrestling and top control to completely maul Paulino from the opening bell to the final one. On the feet, Paulino had the large reach advantage but Pierce was able to duck under his punches, grab his legs, and send him on a ride with powerful slams. Once on the mat, Paulino did a good job of not allowing Pierce to move to better positions but couldn’t manage to escape back to the feet. For all three rounds, Pierce peppered the face and body of Paulino from top position earning him the lopsided unanimous decision victory. Paulino never gave up throughout the fight, which will most likely earn him another shot inside the octagon. Mike Pierce – Another dominant performance for Mike Pierce puts his name on the fast track to the top of the division. I’d like to see Pierce go up against someone who could possibly stop a couple of his takedowns or maybe someone who is great on his back. Maybe Dustin Hazelett, Chris Lytle, or against the giant Anthony Johnson. Julio Paulino – Paulino’s next fight, he will likely be fighting somebody for his UFC career. I’d like to see him go up against somebody in the same boat. Possibly Ricardo Funch, Phil Baroni, or Rob Kimmons. As predicted in an earlier blog of mine, Schaub had a short night of work in Colorado. It took all of 47 seconds for Schaub to get the TKO victory over Chase Gormley in front of his hometown fans. Gormley moved in early, but was knocked down with a right hand from Schaub. Gormley recovered quickly but only to recieve more punishment from the former NFL player. Schaub would knock Gormley down two more times before the referee would call the fight and save him from any more punishment. Great showing for TUF Season 10’s runner-up. Brendan Schaub – Schaub needs more tune up fights before he steps into the higher ranks of the UFC heavyweight division. Possibly Anthony Perosh, Marcus Jones, or Paul Buentello. Chase Gormley – After two losses in a row to start his UFC career, it’s likely back to smaller shows for Gormley. 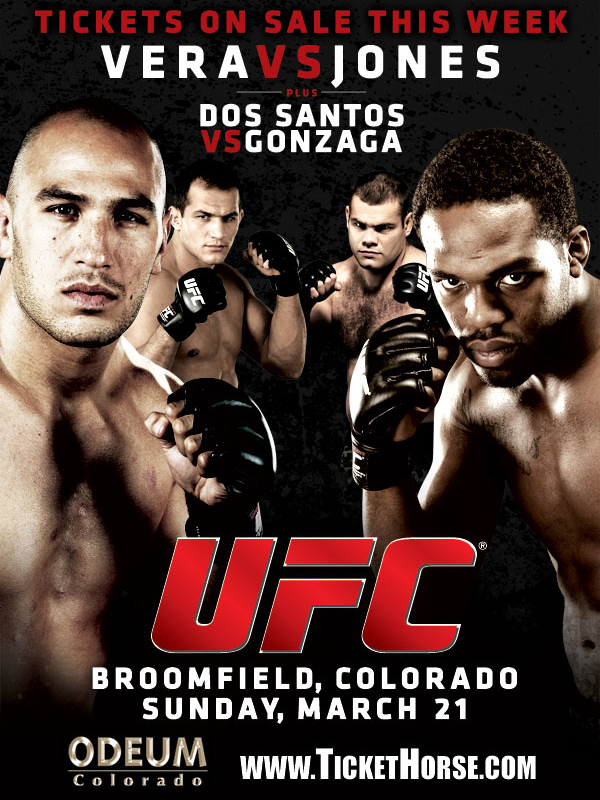 John Howard came in to Colorado 3-0 inside the UFC, but very well could have been 0-3. Howard eked out two split decision victories against Tamden McCrory and Chris Wilson, who many people believe he lost those fights. In his 3rd fight inside the cage, he was being completely dominated by Dennis Hallman before KOing the veteran with just 5 seconds left to go in the fight. For his fourth fight against Roberts, he left no doubt inside the cage. Early in the fight, Roberts used a couple submission attempts to get himself in top position. Howard scrambled to his feet, then used his superior strength to throw Roberts down to the mat. From the bottom, Roberts attempted an omoplata but Howard escaped. Howard stood over Roberts then leaped in with a looping left hand that knocks Roberts out cold. Howard then landed another shot for good meausure before referee Tom Johnson throws him off his downed opponent. An exciting fight with a great finish. John Howard – After 4 straight wins, Howard will get a step up in competition. I know he still probably wants his grudge match with Anthony Johnson. Daniel Roberts – Roberts was incredibly exciting in his loss to Howard. I hope they give him somebody at the bottom of division to increase his confidence. Possibly Ricardo Funch, Julio Paulino, or Rob Kimmons. Another Denver native, Duane Ludwig, didn’t have a sucessful night in front of his hometown crowd like Brendan Schaub did. UFC new-comer went in for an early shoot and Ludwig stuffed it initially. Elkins stayed persistant and eventually earned the take down. Suddenly, Elkins backs off Ludwig and referee Tim Mills waves off the fight. Replay shows that Ludwig’s leg doubled under him and twists his ankle badly. Darren Elkins earns the TKO victory in his first UFC fight, but surely not the way he wanted it to go. Ludwig was helped out of the cage by his corner. Duane Ludwig – Hopefully it’s just a sprain, and nothing is too badly hurt. If he can comeback quickly, i’d like to see a rematch with Elkins. I don’t think Elkins would mind. Darren Elkins – See Above. Eliot Marshall, another Denver native, came into the cage with a 3-0 UFC record. I my predictions blog for this fight, i said Marshall would use his speed advantage to earn a decision victory. On Sunday night, Matyushenko was a step ahead of Marshall for all three rounds. Matyushenko used solid counter-punching techniques to frustrate his opponent all fight. Marshall never seemed to find his range against the much more experienced Matyushenko. The two engaged in a kick boxing match for most of the fight with Matyushenko landing the heavier shots. Matyushenko also succeded on a couple single-leg take downs, but wasn’t able to amount any real offense while on the mat. Two of the judges scored the fight 30-27 for Matyushenko, while one judge saw it 29-28 for Marshall (obviously fell asleep during the slow paced contest). Vladimir Matyushenko – Matyushenko may not be the most exciting fighter in the world, but right now he’s getting the job done. I’d like to see him go up against Ryan Bader, Jon Jones, or Thiago Silva to see if he really has something left in the tank. Eliot Marshall – Marshall needs more fights with people around his experience level. Possibly James Te Huna, Brain Stann, or Kyle Kingsbury would be solid next fights. The always energetic Clay Guida has the entire arena in his corner as the chants of “Guida” erupt as the first bell rang. Clay Guida shot in early for a take down, but Gugerty slapped on a guillotine as he came in. The submission attempt didn’t last long as Guida slammed his way out the hold. Gugerty quickly transitioned to triangle choke but Guida stacked up and gained top position. There wasn’t much action in the first after that, until Guida landed a small flurry of punches. In the second, Guida started out with another slam take down, and again Gugerty tried to lock in the guillotine choke. Once again Guida popped out, but this time in a scramble, Guida locked in an arm triangle choke to force the tap from Gugerty. Clay Guida – A great performance against Gugerty has probably earned Guida one more run against the top guys in the division. Another loss to a top 15 guy may keep him in that gatekeeper role for good. The perfect match-up seems to be Joe Stevenson. One, they are both fan favorites that have struggled against the top of the division. And two, they have never fought each other which is quite impressive for how long they have both been in the UFC. Shannon Gugerty – After 3 losses in 4 fights, Gugerty should be cut from the promotion. Before the real fight, i heard that James Irvin was already in a fight with personal demons. So bad, that a reporter thought he might want to be on suicide watch. I’m not sure if that is true, but it sure looked like it in the cage against Alessio Sakara. Usually Irvin is very energetic before the fight, but tonight he looked like a ghost. There was no expression on his face at all, when Bruce Buffer was announcing his name. Once the fight started, they exchanged punches and leg kicks with Sakara getting the better of the exchanges. Sakara then landed a left hook and Irvin backed up, then fell to the ground holding his eye. Irvin tried to say he was poked, but the replay clearly showed Sakara’s fist was closed. Irvin was looking for a way out the fight, and he got it. Luckily for Sakara, referee Josh Rosenthal was on top of the action and saw that it wasn’t a poke, and was awarded the TKO victory. Very strange ending for UFC’s first fight on Versus. 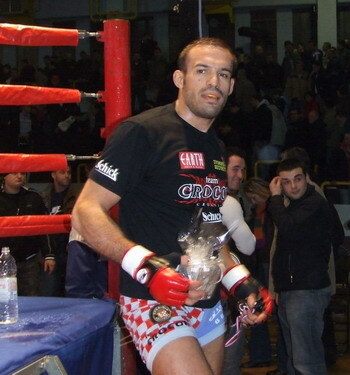 Alessio Sakara – After winning 3 fights in a row, Alessio Sakara is due for a small step up in competition. Possibly Goran Reljic, CB Dollaway, or UFC new-comer Claude Patrick. James Irvin – If the depression thing is true, Irvin should take a while off from fighting. I hope he finds the help he needs. The craziness continues on UFC’s first night on Versus. Cheick Kongo was not going to take a chance of getting knocked out Paul Buentello tonight. Everyone thought these to large heavweights were going to bang it out from start to finish, but Kongo had other plans. Kongo showed he was going to take Buentello down and pound him out from the beginning bell. Half way through the first, Paul Buentello dislocated his pinky finger on a scramble to the feet and the fight was stopped. He first tried to pop it back himself, but later had the doctor do it. They got it popped back in and the fight continued. Kongo proved to be a horrible match-up for Buentello as the fight wore on, the take downs become unstoppable. It all lead to Paul Buentello tapping out due to elbow strikes to the body. Impressive preformance for Kongo again, but they only ever seem to occur against mid-level opponents. Cheick Kongo – Another guy that’s trying to stay out of that gatekeeper role. He looks amazing against lesser talent, and awful against top talent. What do you do with a guy like this? A fight with Gabriel Gonzaga would leave the winner with one more shot at a title run, and the other on undercards from here on out. Paul Buentello – I love Paul Buentello, but the game has just passed him by. It’s hard to see the UFC dropping him after his second consecutive loss, due to the fact they don’t want to give any heavyweights to Strikeforce that has any name recognition. If he stays, he could be a solid test for up and comers like Brendan Schaub, Chris Tuchscherer, or Marcus Jones. So close! We almost got to see Junior dos Santos’ ground game. Gonzaga caught a kick from Dos Santos and got the sweep to the ground, but in an instant he was able to get back to his feet. Then Dos Santos did what Dos Santos does…. Gonzaga came in with a leg kick, Dos Santos countered with a left that dropped Gonzaga and followed it up with a few more shots that put his fellow Brazillian to sleep. Another dominating performance for the rising superstar heavyweight. Junior Dos Santos – Cain Velasquez. There is no other fight i’d rather see. Gabriel Gonzaga – Cheick Kongo. So that just happened. Jon Jones didn’t disappoint in his toughest test to date. From the opening bell, he tossed Brandon Vera around like a rag doll. Most of the fight took place inside Brandon Vera’s closed gaurd. Jones left his arm out there dangerously as he worked to break distance and drop bombs, but Vera never even attempted an armbar. Vera seemed satisfied to try and keep Jones close and earn a stand up, but that never happened. At one point, Jon Jones postured up and Vera landed an up-kick to the jaw of Jones while his knee was still on the ground. Herb Dean stopped the fight, and deducted a point from Vera for the illegal blow. Jones opted to return to the same position, and it proved to be the right move. Shortly after the fight was restarted, Jones swung a looping left elbow that struck Vera right in the eye. Instantly, you could see Vera was hurt badly as he covered his face, rolled over, and turtled up. Jones landed a few more shots before Herb Dean stopped the fight and Jones was awarded the TKO victory. Jon Jones looked unstopable again. The sky is the limit for this future superstar. Jon Jones – Man, my brain says to keep giving Jones mid-level guys, so he can continue honing his skills. But i can’t help but want to see him against people like Forrest Griffin or the loser or Rampage/Rashad Evans. Ok, one more skill building fight…. Vladimir Matyushenko. If he dismantles Matyushenko, you can’t stop him from the top guys. Brandon Vera – Like i said earlier, Vera is probably very lucky the UFC doesn’t want to give Strikeforce any big named fighters. Most likely Vera’s UFC career will have him stuck on the undercards unless he goes on a big run. Possible next opponents could be: Jason Brilz, Matt Hamill, or a rematch with Keith Jardine. Posted by Matt Faler on March 21, 2010 in News and Notes, UFC, What or Who's Next?